This is a list of commercial Long-Term Evolution (LTE) networks in Asia, grouped by their frequency bands. Some operators use multiple bands and are therefore listed multiple times in respective sections. For technical details on LTE and a list of its designated operating frequencies, bands, and roaming possibilities, see LTE frequency bands. Note: This list of network deployments does not imply any widespread deployment or national coverage. Available in 3 of 20 circles. CA[G 1] of 25 MHz (CA_3A_40A). License in all 22 circles (Nationwide). Available in 11 of 22 circles. Spectrum Sharing with RCOM in 5 circles. Network available to RCOM customers. License in 20 of 22 circles. Pre-commercial service as of Jun 2016. Available in 19 of 22 circles. Available in 2 of 22 circles. Available in 1 of 3 circles. Available in 9 of 12 circles. Available in Uralsk and Aksay. (?) Apr 2015 (?) Available in Vientiane. Pre-commercial service as of Feb 2014. CA[G 1] of 40 MHz (CA_3A_7A). Provider formerly branded as Wataniya. CA[G 1] of 30 MHz (CA_3A_28A). 1 MHz remains for GSM services. CA[G 1] of 15 MHz (CA_3A_5A). 3,8 MHz remain for GSM services. CA[G 1] of 20 MHz (CA_3A_8A). 7,4 MHz remain for GSM services. 9,8 MHz remain for GSM services. 2,6 MHz remain for GSM services. Available in Lahore and Karachi. CA[G 1] of 15 MHz (CA_7A_20A). CA[G 1] of 60 MHz (CA_3A_7C). Joint infrastructure operation with VimpelCom. CA[G 1] of 40 MHz (CA_7C). Available in Moscow region only. CA[G 1] of 25 MHz (CA_3A_7A_20A) (Demo). CA[G 1] of 30 MHz (CA_3A_38A) (Demo). CA[G 1] of 40 MHz (CA_3A_7A_38A). Tattelecom 1800 3 Jun 2014  Available in Tartarstan. Vainakh Telecom 2300 40 Sep 2013  Available in Chechnya. 15 MHz remain for GSM services. 10 MHz remain for GSM services. 2,5 MHz remain for GSM services. 5 MHz remain for GSM services. (4x4 MIMO, 256 QAM) (Cat.15+) (Demo). Babilon Mobile 2100 1 Oct 2012  Available in Kulob. Available in Ashgabat and Türkmenbaşy. Available in Tashkent and Samarkand. ^ a b c d e f g h i j k l m n o p q r s t u v w x y z aa ab ac ad ae af ag ah ai aj ak al am an ao ap aq ar as at au av aw ax ay az ba bb bc bd be bf bg bh bi bj bk bl bm bn bo bp bq br bs bt bu bv bw bx by bz ca cb cc cd ce cf cg ch ci cj "spectrummonitoring.com - Frequencies ITU Region 3". spectrummonitoring.com. 2018-12-20. Retrieved 2018-12-20. ^ "AWCC rolls out LTE to Herat and Baghlan". TeleGeography. 2017-12-06. Retrieved 2018-03-23. ^ a b c d e f g h i j k l m n o p q r s t "spectrummonitoring.com - Frequencies ITU Region 1". spectrummonitoring.com. 2018-12-20. Retrieved 2018-12-20. ^ "Beeline to build Armenian LTE network before end-2015". TeleGeography. 2015-05-20. Retrieved 2015-05-20. ^ "CTO: VimpelCom analyzes opportunities to launch LTE-450 - LTE-450 network went live in Armenia last month". RCR Wireless News. 2016-08-12. Retrieved 2016-09-22. ^ "Beeline launches 450MHz fixed-wireless network across Armenia". TeleGeography. 2016-09-03. Retrieved 2016-09-22. ^ "ArmenTel makes beeline to 4G with Yerevan LTE pilot". TeleGeography. 2016-09-08. Retrieved 2016-09-08. ^ "ArmenTel (Beeline) expands 4G network; launches 4G roaming". TeleGeography. 2016-12-14. Retrieved 2016-12-14. ^ "U!com launches commercial VoLTE solution". TeleGeography. 2017-12-05. Retrieved 2017-12-10. ^ "Ericsson deploys U!com's 4G+ network in Yerevan". TeleGeography. 2016-09-26. Retrieved 2016-09-26. ^ "Armenia's VivaCell-MTS switches on 4G/LTE network". TeleGeography. 2012-01-03. Retrieved 2013-07-10. ^ "VivaCell-MTS launches 4G offer at 3G prices". TeleGeography. 2014-12-23. Retrieved 2014-12-23. ^ "VivaCell-MTS changes company name to MTS Armenia". TeleGeography. 2017-04-25. Retrieved 2017-04-25. ^ "Azercell makes first VoLTE call in Azerbaijan". TeleGeography. 2017-12-15. Retrieved 2017-12-19. ^ "Azercell unveils LTE network". TeleGeography. 2012-05-25. Retrieved 2013-07-10. ^ "Nar launches 4G LTE services in Baku". TeleGeography. 2015-05-08. Retrieved 2016-01-28. ^ "Nar further extends LTE reach to Ganja". TeleGeography. 2017-11-29. Retrieved 2017-12-03. ^ "Bakcell launches commercial 4G LTE services". TeleGeography. 2015-05-06. Retrieved 2015-05-06. ^ "Bakcell demonstrates peak speeds of 225Mbps". TeleGeography. 2015-12-03. Retrieved 2015-12-03. ^ "Bakcell launches LTE service in Ganja". TeleGeography. 2017-11-17. Retrieved 2017-11-17. ^ a b c "GrameenPhone, Robi Axiata and Banglalink launch 4G services". TeleGeography. 2018-02-21. Retrieved 2018-02-21. ^ "Banglalion, Qubee launching LTE following regulatory approval". TeleGeography. 2013-10-07. Retrieved 2018-05-23. ^ "Banglalion finally nearing LTE launch as Alepo provides support". TeleGeography. 2015-07-29. Retrieved 2015-07-30. ^ "Banglalion 4G LTE is on air". Banglalion. Retrieved 2018-05-22. ^ "Ollo LTE licence paid in full". TeleGeography. 2014-02-28. Retrieved 2014-09-21. ^ "Ollo gets merger permission". TeleGeography. 2014-07-21. Retrieved 2018-05-21. ^ "Ollo's commercial LTE launch set for December after spectrum interference delays". TeleGeography. 2015-11-18. Retrieved 2015-11-18. ^ "Ollo launches 4G LTE network in Sylhet". Daily Sun. 2015-12-02. Archived from the original on 2017-02-02. Retrieved 2016-10-11. ^ "Qubee switches on LTE; agrees to transfer WiMAX subscribers to rival Banglalion". TeleGeography. 2018-07-10. Retrieved 2018-07-10. ^ "BTRC grants Robi tech neutrality in 900MHz, 1800MHz bands". TeleGeography. 2018-02-05. Retrieved 2018-02-05. ^ "Robi, Airtel launch LTE-A in Singra". TeleGeography. 2018-04-16. Retrieved 2018-04-16. ^ "Teletalk launches 4G LTE services in Dhaka". TeleGeography. 2018-12-20. Retrieved 2018-12-20. ^ "CamGSM invests USD200m to expand 4G network". TeleGeography. 2016-10-13. Retrieved 2016-10-13. ^ "Emaxx teams up with Huawei for 4G network rollout". TeleGeography. 2014-09-19. Retrieved 2014-09-19. ^ "Cambodian ISP Emaxx relaunches as Kingtel". TeleGeography. 2016-01-07. Retrieved 2018-06-10. ^ "Metfone launches LTE-A". TeleGeography. 2018-05-23. Retrieved 2018-05-23. ^ a b c d e f g h i j k l m n o p q r s t u v w x y z aa ab ac ad ae af ag "GSA Network 2020 - VoLTE launches" (PDF). GSA. 2016-01-31. Retrieved 2016-02-26. ^ "SEATEL switches on 4G network in 17 provinces". TeleGeography. 2015-07-27. Retrieved 2015-07-27. ^ "4G operator SEATEL wins 2600MHz licence in Cambodian re-auction". TeleGeography. 2016-12-23. Retrieved 2018-06-10. ^ "Smart switches on LTE in Phnom Penh". TeleGeography. 2014-01-24. Retrieved 2014-01-25. ^ "Smart boosts maximum 4G speeds to 600Mbps". TeleGeography. 2017-08-22. Retrieved 2017-08-22. ^ "China Mobile launched VoLTE pre-commercial services in Beijing". c114. 2015-11-10. Retrieved 2016-02-18. ^ "China Mobile Completes VoLTE Network Deployment". ChinaTechNews. 2016-07-08. Retrieved 2017-04-01. ^ a b c "DT and China's big three launch NB-IoT". mobileworldlive.com. 2017-06-26. Retrieved 2018-12-14. ^ "China to launch 4G networks on 18 December". TeleGeography. 2013-11-25. Retrieved 2013-11-25. ^ "China Mobile, Huawei complete uplink CA field trial". TeleGeography. 2015-02-05. Retrieved 2018-12-15. ^ "ZTE, Qualcomm and China Mobile show off 3x CA TD-LTE". TeleGeography. 2015-03-06. Retrieved 2015-03-07. ^ "China Mobile verifies TDD inter-band CA". telecomasia.net. 2015-05-27. Retrieved 2018-12-15. ^ "China Mobile, ZTE, Qualcomm test 3-CA LTE-A". telecomasia.net. 2015-06-18. Retrieved 2018-12-15. ^ "China Mobile, Huawei deploy wideband Massive MIMO site on live network". TeleGeography. 2016-11-09. Retrieved 2016-11-09. ^ "China Mobile achieves 1Gbps speeds using 20MHz spectrum block". TeleGeography. 2017-09-01. Retrieved 2017-09-03. ^ "China Mobile handed FDD-LTE licence". TeleGeography. 2018-04-05. Retrieved 2018-04-05. ^ "Case studies - 4G TD-LTE and 3G TD-SCDMA". spectrummonitoring.com. 2014-09-12. Retrieved 2016-01-29. ^ "China Telecom: The Pre-commercial VoLTE Services Roll out Nationwide since November 29". c114. 2018-11-27. Retrieved 2018-12-14. ^ a b "China allocates spectrum for nationwide 5G trials". telecomasia.net. 2018-12-10. Retrieved 2018-12-14. ^ "Telecom launches commercial TD-LTE network". TeleGeography. 2014-02-17. Retrieved 2014-02-17. ^ a b "MIIT awards long-awaited FDD licences". TeleGeography. 2015-03-02. Retrieved 2015-03-02. ^ "Telecom builds 'world's largest' FDD-LTE network, sets out plans for three-layered 'target network'". TeleGeography. 2015-07-07. Retrieved 2015-07-07. ^ "Telecom to place focus on CA technology". TeleGeography. 2015-09-21. Retrieved 2015-09-22. ^ "China Telecom unveils network improvement plans". TeleGeography. 2016-07-19. Retrieved 2018-07-13. ^ "China Telecom completes 800MHz LTE rollout; big three end domestic roaming charges". TeleGeography. 2017-07-31. Retrieved 2017-07-31. ^ "China Telecom lines up 3C, VoLTE, VoWiFi trials". TeleGeography. 2016-07-22. Retrieved 2016-07-22. ^ "China Unicom launches commercial VoLTE trial". TeleGeography. 2016-03-22. Retrieved 2016-03-22. ^ "Unicom launches 4G trials; Mobile ramps up rollout". TeleGeography. 2014-03-19. Retrieved 2016-01-27. ^ "Unicom to roll out hybrid TD-LTE/FD-LTE networks in 16 cities". TeleGeography. 2014-06-30. Retrieved 2014-06-30. ^ "Cellcos push for FDD licences by May; Unicom installs 100,000 4G base stations". TeleGeography. 2015-02-03. Retrieved 2015-12-31. ^ "China Unicom accelerates 4G rollout". TeleGeography. 2015-09-21. Retrieved 2015-09-21. ^ "China Unicom, Ericsson announce Gigabit LTE, LTE Broadcast launch". TeleGeography. 2017-08-24. Retrieved 2017-08-24. ^ "MagtiCom widens availability of VoLTE service". TeleGeography. 2018-08-16. Retrieved 2018-08-16. ^ "MagtiCom launches LTE in main cities". TeleGeography. 2015-02-03. Retrieved 2015-02-03. ^ "MagtiCom switches on LTE-A network". TeleGeography. 2016-06-06. Retrieved 2016-06-06. ^ "MagtiCom offers 430Mbps mobile speeds in central Tbilisi". TeleGeography. 2018-09-25. Retrieved 2018-09-25. ^ "Mobitel launches 4G in 30 cities". TeleGeography. 2015-02-04. Retrieved 2015-02-04. ^ "Geocell, SilkNet complete merger". TeleGeography. 2018-11-02. Retrieved 2018-11-02. ^ "Silknet". Halberd Bastion. 2017-10-21. Retrieved 2019-01-10. ^ "Geocell switches on LTE in Tbilisi". TeleGeography. 2015-03-17. Retrieved 2015-03-17. ^ "Geocell launches LTE-A, tests HD Voice". TeleGeography. 2018-09-20. Retrieved 2018-09-20. ^ "PCCW (HKT) launches VoLTE; 3 HK not far behind". TeleGeography. 2014-05-16. Retrieved 2016-02-18. ^ "3 earmarks 2.3GHz licence for TDD-LTE deployment". TeleGeography. 2012-02-08. Retrieved 2016-01-29. ^ "3 Hong Kong to launch FDD-TDD LTE-A network in 2016". TeleGeography. 2015-07-14. Retrieved 2016-01-29. ^ "3 HK refarms 900MHz for 4G, has plans for LTE-A, TD-LTE, small cells". TeleGeography. 2016-07-22. Retrieved 2016-07-22. ^ "3 Hong Kong's five-band carrier aggregation LTE goes live this month". TeleGeography. 2018-03-09. Retrieved 2018-03-10. ^ "China Mobile Hong Kong selects Ericsson for VoLTE deployment". TeleGeography. 2015-01-02. Retrieved 2016-02-26. ^ "China Mobile Hong Kong LTE launching on 25 April". TeleGeography. 2012-04-20. Retrieved 2016-01-29. ^ "China Mobile Hong Kong's LTE FDD/TDD launch included first China-Hong Kong TD-LTE roaming". TeleGeography. 2012-12-20. Retrieved 2013-07-05. ^ "China Mobile HK, Ericsson trial LTE-A FDD+TDD 3CC aggregation". TeleGeography. 2015-08-04. Retrieved 2015-08-04. ^ "China Mobile HK, Huawei claim world's first 2.3GHz TDD Massive MIMO test". TeleGeography. 2016-11-15. Retrieved 2016-11-15. ^ "ZTE supports CSL's full VoLTE launch". TeleGeography. 2014-10-27. Retrieved 2016-02-18. ^ a b c "PCCW, CTM implement Hong Kong-Macau VoLTE service". TeleGeography. 2017-04-20. Retrieved 2017-04-20. ^ "CSL launches LTE services for existing consumer 1010 subscribers". TeleGeography. 2011-05-17. Retrieved 2016-01-29. ^ "SAR Wars 4G: cellcos do battle over LTE". TeleGeography. 2012-05-04. Retrieved 2013-07-06. ^ "CSL claims first 1800MHz/2600MHz dual-band LTE launch". TeleGeography. 2012-08-24. Retrieved 2013-07-05. ^ "CSL switches on additional 4G spectrum, claims 95% coverage". TeleGeography. 2013-05-23. Retrieved 2016-01-29. ^ "PCCW, 3 raise LTE speeds to 150Mbps via 2600MHz upgrade; PCCW pushes 80GB plan". TeleGeography. 2013-06-24. Retrieved 2014-08-19. ^ "CSL activates extra LTE 1800MHz bandwidth". TeleGeography. 2013-07-05. Retrieved 2016-01-29. ^ "HKT begins marketing 'csl' unified brand". TeleGeography. 2014-07-07. Retrieved 2016-01-29. ^ "CSL upgrades to 300Mbps LTE-A". TeleGeography. 2014-12-22. Retrieved 2014-12-22. ^ "HKT, Huawei demo 450Mbps LTE-A ahead of 2016 launch". TeleGeography. 2015-04-24. Retrieved 2015-04-25. ^ "HKT launches 600Mbps LTE-A". TeleGeography. 2017-05-26. Retrieved 2017-05-26. ^ "SmarTone joins LTE market, also goes after budget 3G segment". TeleGeography. 2012-08-29. Retrieved 2013-07-06. ^ "FY15 Annual Results Presentation" (PDF). SmarTone Telecommunications Holdings Limited. 2015-09-01. Retrieved 2016-01-29. ^ "SmarTone reports 74% rise in FY net profits". TeleGeography. 2015-09-03. Retrieved 2016-01-29. ^ a b "SmarTone tests 1800MHz FDD Massive MIMO with Ericsson". TeleGeography. 2017-10-31. Retrieved 2017-11-05. ^ "SmarTone launches LAA LTE". TeleGeography. 2018-08-31. Retrieved 2018-08-31. ^ "Tri Indonesia aims to launch 1800MHz LTE in six cities in early 2016". TeleGeography. 2015-12-08. Retrieved 2015-12-08. ^ a b c d e "Big five launch LTE in 1800MHz band as new player targets October launch". TeleGeography. 2015-07-08. Retrieved 2015-07-08. ^ a b "Tri, Indosat Ooredoo win additional 2.1GHz frequencies". TeleGeography. 2017-10-31. Retrieved 2018-06-26. ^ "Berca to launch commercial LTE service 'Hinet' in 2H16". TeleGeography. 2016-05-27. Retrieved 2016-05-28. ^ a b c "Telkomsel's 4G launch prompts instant response from XL and Indosat". TeleGeography. 2014-12-09. Retrieved 2014-12-10. ^ "Indosat Ooredoo launches LTE-A as it sets out 4G aspirations". TeleGeography. 2015-12-01. Retrieved 2015-12-01. ^ "STI rebrands to Net1 ahead of Indonesian 4G launch, report says". TeleGeography. 2017-05-12. Retrieved 2017-08-24. ^ "Net1 Indonesia plans full commercial launch in 2018". TeleGeography. 2017-06-23. Retrieved 2017-06-23. ^ "Net1 Indonesia expands 4G LTE to the island of Bali". TeleGeography. 2017-08-24. Retrieved 2017-08-24. ^ "Smartfren and Mitel launch Indonesia's first VoLTE service with SPIRIT DSP". TeleGeography. 2016-07-28. Retrieved 2016-07-28. ^ "Smartfren ups network capacity; lays out LTE ambitions". TeleGeography. 2015-06-22. Retrieved 2015-06-22. ^ "Smartfren launches LTE-A in Jakarta". TeleGeography. 2015-08-21. Retrieved 2015-08-22. ^ "Smartfren to take on Bolt! 's 4G operations in Indonesia, paper says". TeleGeography. 2019-01-03. Retrieved 2019-01-03. ^ "Telkomsel adds eighth city to 4G footprint". TeleGeography. 2015-10-12. Retrieved 2015-10-13. ^ "Telkomsel debuts 4.5G in nine Indonesian cities". TeleGeography. 2016-12-09. Retrieved 2016-12-10. ^ "Telkomsel Indonesia begins to utilise new 2300MHz frequencies". TeleGeography. 2018-01-03. Retrieved 2018-01-03. ^ "XL Axiata launches LTE in Lombok; Indosat to accelerate 4G rollout". TeleGeography. 2015-07-06. Retrieved 2015-07-06. ^ "XL Axiata to test VoLTE". TeleGeography. 2017-06-30. Retrieved 2017-07-04. ^ "XL Axiata launches LTE in three Indonesian cities". TeleGeography. 2014-12-22. Retrieved 2014-12-22. ^ "XL Axiata launches Super HotRod 4G LTE in Jakarta". TeleGeography. 2015-11-18. Retrieved 2015-11-18. ^ "XL Axiata reaches eight million 4G users, plans network improvements". TeleGeography. 2016-08-11. Retrieved 2016-08-11. ^ "XL Axiata to spend USD250m on 4G in 2016". TeleGeography. 2016-09-01. Retrieved 2016-09-01. ^ a b c "【2016年4月更新】LTEの中心周波数とEARFCNリスト" (in Japanese). gadget-and-radio.com. 2016-04-04. Retrieved 2016-10-02. ^ a b c "各携帯電話事業者の通信方式と周波数帯" (PDF) (in Japanese). Ministry of Internal Affairs and Communication. 2017-06-08. Retrieved 2017-06-15. ^ "Approval of Establishment Plans for Specified Base Stations for Introduction of 4G Mobile Communications Systems" (in Japanese). Ministry of Internal Affairs and Communications. 2014-12-19. Retrieved 2014-12-20. ^ "「UQ mobile」が、高音質通話VoLTEに対応に". UQ Communications. 2015-11-16. Retrieved 2016-07-01. ^ "KDDI confirms LTE migration plan; but will use WiMAX/Wi-Fi too". TeleGeography. 2010-11-17. Retrieved 2016-01-24. ^ "Japan set for two LTE launches this week as iPhone 5 hits the stores". TeleGeography. 2012-09-18. Retrieved 2016-01-24. ^ "KDDI upgrades to 100Mbps; 800MHz, 2100MHz LTE reaches 97%, 71% of population". TeleGeography. 2013-06-20. Retrieved 2016-01-24. ^ "UQ turns up WiMAX 2+ in Tokyo". UQ Communications. 2013-10-30. Retrieved 2016-07-01. ^ "au smartphones and tablets to support both LTE-Advanced (CA) and WiMAX 2+ next-generation communication networks!". KDDI Corporation. 2014-05-08. Retrieved 2015-08-28. ^ "auのLTEが下り最大225Mbpsへ、まずは100局程度で" (in Japanese). Impress. 2015-04-06. Retrieved 2015-11-09. ^ "KDDI、山形県の一部でau 4G LTEを下り最大300Mbpsで10月下旬より提供開始" (in Japanese). s-max.jp. 2015-10-20. Retrieved 2015-11-09. ^ "au、下り最大370Mbpsのサービスを提供へ" (in Japanese). Impress Watch. 2016-05-10. Retrieved 2016-06-30. ^ "受信最大708Mbpsの提供開始" (in Japanese). KDDI. 2017-08-31. Retrieved 2017-09-03. ^ "業界最速！ 下り最大110Mbpsを実現する次世代ネットワーク・サービスを11月1日より開始" (in Japanese). Wireless City Planning. 2011-09-29. Retrieved 2016-04-01. ^ "Softbank sets Friday as 4G launch date". TeleGeography. 2012-02-21. Retrieved 2013-07-07. ^ "Second LTE mobile network in Japan launched by eMobile". TeleGeography. 2012-03-16. Retrieved 2013-07-06. ^ "Softbank's trial LTE-A in 3.5GHz band achieves 770Mbps". TeleGeography. 2013-09-13. Retrieved 2015-06-07. ^ "SoftBankが10MHz幅でプラチナバンドLTE基地局の認可を取得" (in Japanese). blog of mobile. 2014-07-14. Retrieved 2014-11-01. ^ "キャリアアグリゲーションの導入について" (in Japanese). Wireless City Planning. 2014-08-29. Retrieved 2016-04-01. ^ "Status of WCP's AXGP". XGP Forum. 2015-06-18. Retrieved 2016-04-01. 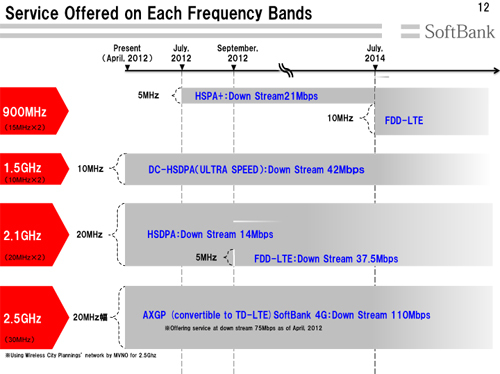 ^ "Softbank - Services Offered on Each Frequency Bands". Softbank. 2015-06-30. Retrieved 2016-12-26. ^ "LTEサービスの拡大および一部の3Gサービス終了について | ソフトバンク株式会社 | グループ企業 | 企業・IR | ソフトバンクグループ" (in Japanese). Softbank. 2015-12-11. Retrieved 2017-06-15. ^ "ソフトバンク、FDD-LTE方式の高速通信サービス「SoftBank 4G LTE」にてCAによる下り最大187.5Mbpsを2015年8月より一部エリアにて順次提供開始" (in Japanese). S-MAX. 2015-08-16. Retrieved 2015-11-09. ^ "「256QAM」を利用した高速通信サービスの提供について" (in Japanese). Softbank. 2016-10-12. Retrieved 2016-12-21. ^ "Huawei, SoftBank complete test of 3.5GHz Massive MIMO with CA". TeleGeography. 2017-02-27. Retrieved 2017-02-27. ^ "ソフトバンク、SoftBank向け「2018年夏モデル」を発表！HUAWEI Mate 10 ProやXperia XZ2、AQUOS R2などスマホ6機種やスマート体組成計。4CAで下り最大774Mbpsも提供開始". livedoor News. 2018-05-10. Retrieved 2018-11-26. ^ "NTT DOCOMO introduces VoLTE in Japan". TeleGeography. 2014-06-24. Retrieved 2016-02-18. ^ "NTT DoCoMo launches commercial LTE network". TeleGeography. 2010-12-29. Retrieved 2013-07-06. ^ "2012年11月からLTEを100Mに増速---NTTドコモ" (in Japanese). ITpro. 2013-01-08. Retrieved 2013-07-25. ^ "DoCoMo eyes 700MHz LTE in 2015". TeleGeography. 2013-02-20. Retrieved 2018-11-29. ^ "NTT DoCoMo to upgrade LTE speeds to 150Mbps in Kawasaki". TeleGeography. 2013-07-26. Retrieved 2016-02-01. ^ "DOCOMO serves up LTE-A fry-day: 225Mbps starter leaves room for 300Mbps dessert". TeleGeography. 2015-03-25. Retrieved 2015-03-25. ^ "ドコモ、3波キャリアアグリゲーションで下り300Mbpsを11月開始" (in Japanese). Impress Watch. 2015-09-15. Retrieved 2018-11-29. ^ "ドコモが下り375Mbpsを6月開始、3.5GHz帯のサービスも" (in Japanese). Impress Watch. 2016-03-02. Retrieved 2016-07-01. ^ "ドコモが3.5GHz帯でサービス開始、全国の主要駅周辺で". Impress Watch. 2016-06-29. Retrieved 2016-06-30. ^ "国内最速となる受信時最大682Mbpsの通信サービスを提供開始" (in Japanese). NTT DoCoMo. 2017-03-07. Retrieved 2017-03-07. ^ "NTTドコモが4CC CAを導入、一部機種はアップデートで対応" (in Japanese). blogofmobile.com. 2017-10-18. Retrieved 2018-11-30. ^ "ドコモのLTE、下り最大988Mbpsに　2018年夏モデル6機種が対応" (in Japanese). ITMedia. 2018-05-16. Retrieved 2018-06-08. ^ "モバイルの通信速度はギガを超える - 受信時最大1288Mbpsを2019年春より提供" (in Japanese). NTT DoCoMo. 2018-10-17. Retrieved 2018-11-30. ^ "Kyrgyzstan's Sky Mobile introduces LTE services to all regions". TeleGeography. 2016-05-19. Retrieved 2016-05-19. ^ a b "Megacom launches LTE in three cities; Nur expands 4G network". TeleGeography. 2016-03-11. Retrieved 2016-03-11. ^ "Kyrgyz splurge: cellcos invest in 4G speed boosts". TeleGeography. 2017-01-04. Retrieved 2017-01-04. ^ "MegaCom adding UMTS-900 services to 3G/4G line-up". TeleGeography. 2017-01-23. Retrieved 2018-07-05. ^ "MegaCom wins 1800MHz licence tender". TeleGeography. 2018-01-19. Retrieved 2018-01-23. ^ "Go O! Nur Telecom launches 4G". TeleGeography. 2014-05-12. Retrieved 2014-05-12. ^ "O! 4G coverage nears a third of Kyrgyz population". TeleGeography. 2017-05-25. Retrieved 2017-05-25. ^ "Saima Telecom picks Dovado Tiny 4G/LTE broadband routers". Telecompaper. 2012-03-08. Retrieved 2016-01-30. ^ "Celcom introduces commercial LTE services in Klang Valley". TeleGeography. 2013-04-24. Retrieved 2013-07-06. ^ "Celcom gets listed as 4G LTE supported carrier for iPhone 5". SoyaCincau.com. 2013-06-16. Retrieved 2016-02-01. ^ "LTE joint rollout inked by Celcom, Puncak Semangat". TeleGeography. 2013-07-05. Retrieved 2016-02-01. ^ "Celcom inks deal with NSN for Klang Valley network transformation". TeleGeography. 2013-09-25. Retrieved 2016-02-01. ^ "Digi Voice-over-LTE (VoLTE) now available, limited to iPhones". Malaysian Wireless. 2016-10-26. Retrieved 2016-10-27. ^ "DiGi switches on LTE in select locations in Klang Valley". TeleGeography. 2013-07-08. Retrieved 2016-02-01. ^ "Digi to deploy 1,500 additional LTE sites by end-2015". Telecompaper. 2015-10-12. Retrieved 2016-02-27. ^ "DiGi 4G LTE coverage now at 60%, LTE-A with 150Mbps speed now available". Malaysian Wireless. 2015-10-13. Retrieved 2016-02-27. ^ "VIDEO: Digi has big news! Here's how it affects you". Digi. 2017-06-14. Retrieved 2017-06-15. ^ "Maxis and REDtone 4G infrastructure sharing deal". TeleGeography. 2012-07-16. Retrieved 2016-02-27. ^ "Maxis rings in the New Year with Klang Valley LTE launch". TeleGeography. 2013-01-02. Retrieved 2013-07-06. ^ "iPhone 5 and iPad Owners Rejoice as Maxis Becomes First Operator in Malaysia to Bring 1800MHz (Band 3) LTE". SoyaCincau.com. 2013-04-10. Retrieved 2016-02-01. ^ "Maxis prompts Digi and Celcom to a discussion on setting industry standards for 4G LTE". SoyaCincau.com. 2015-11-10. Retrieved 2016-02-01. ^ "Telekom Malaysia launches LTE-based broadband service in Kedah". TeleGeography. 2014-08-12. Retrieved 2014-08-12. ^ "webe is focused on building a high capacity network in 2017". Soyacincau. 2016-12-08. Retrieved 2017-05-17. ^ "U Mobile customers can enjoy better voice calls with VoLTE". SoyaCincau. 2017-05-11. Retrieved 2017-07-08. ^ "U Mobile launches commercial 4G services". TeleGeography. 2013-12-18. Retrieved 2013-12-18. ^ "U Mobile 4G LTE-Advanced network, 100Mbps in Kota Belud". malaysian wireless. 2016-08-16. Retrieved 2017-05-17. ^ "Yes rolls out LTE. Widest 4G coverage with VoLTE support". SoyaCincau. 2016-06-15. Retrieved 2016-09-12. ^ "Yes rolls out LTE. Widest 4G coverage with VoLTE support". SoyaCincau. 2016-06-15. Retrieved 2018-06-27. ^ "ACS launches LTE network". TeleGeography. 2018-05-30. Retrieved 2018-05-30. ^ "2600Mhz 4G Spectrum Bid Results". Internet in Myanmar. 2016-10-18. Retrieved 2018-08-04. ^ "MPT soft-launches 4G services". TeleGeography. 2016-10-17. Retrieved 2016-10-17. ^ "MPT launches commercial LTE in 1800MHz band". TeleGeography. 2017-05-31. Retrieved 2017-05-31. ^ "MPT upgrades to LTE-A a month after launching LTE". TeleGeography. 2017-06-21. Retrieved 2017-06-21. ^ "MPT demonstrates 3C, VoLTE; will extend LTE+ to 280 townships by end-2018". TeleGeography. 2017-12-22. Retrieved 2017-12-22. ^ "Faster Data, Better Calls, Everywhere' is the Future of MPT LTE+". TeleGeography. 2017-12-21. Retrieved 2017-12-22. ^ "MPT to roll out LTE-A to 300 townships by year-end". TeleGeography. 2018-09-17. Retrieved 2018-09-19. ^ "MyTel kicks off commercial services". TeleGeography. 2018-03-27. Retrieved 2018-03-27. ^ "Ooredoo launches Myanmar's first 4G LTE service". TeleGeography. 2016-05-24. Retrieved 2016-05-24. ^ "Ooredoo Myanmar rolls out LTE on 1800MHz band". TeleGeography. 2017-06-29. Retrieved 2017-07-04. ^ "Ooredoo to launch 4G Pro in Myanmar". internetinmyanmar.com. 2017-11-07. Retrieved 2018-02-07. ^ "Ooredoo Myanmar steps up rollout of its 4G network". The Nation. 2018-01-20. Retrieved 2018-03-10. ^ "Ooredoo launches LTE-A upgrade; Telenor adds seven cities to LTE footprint". TeleGeography. 2018-02-07. Retrieved 2018-02-07. ^ "Telenor Myanmar tests 4G technology in five cities". TeleGeography. 2016-06-30. Retrieved 2016-06-30. ^ "Telenor Myanmar launches LTE in Nay Pyi Taw". TeleGeography. 2016-07-08. Retrieved 2016-07-08. ^ "Telenor Myanmar snaps up 1800MHz spectrum". TeleGeography. 2017-05-23. Retrieved 2017-05-23. ^ "Telenor launches 4G/LTE in Yangon". Telenor Myanmar. 2017-06-15. Retrieved 2017-12-22. ^ "Telenor pays USD80m for additional 1800MHz spectrum". TeleGeography. 2017-12-21. Retrieved 2017-12-22. ^ a b "List of mobile frequency bands in the Philippines". txtbuff news. 2016-12-17. Retrieved 2017-06-05. ^ a b "The 700 MHz Frequency and the Philippine Telecom Duopoly". bulatlat.com. 2016-06-26. Retrieved 2018-06-29. ^ "Globe launches 'Tattoo Black' LTE service; unveils 4G smartphones". TeleGeography. 2012-10-02. Retrieved 2013-07-06. ^ "Globe launches LTE-TDD, LTE-FDD in Visayas, Mindanao". Telecompaper. 2014-09-26. Retrieved 2014-09-26. ^ "Globe Telecom switches on first 700MHz cell site, claims 100Mbps in speed test". TeleGeography. 2016-06-07. Retrieved 2016-06-08. ^ "Globe Telecom lights up additional 700MHz cell sites in Davao City". TeleGeography. 2016-06-30. Retrieved 2016-06-30. ^ "Globe launches first LTE-A 4CC solution in Philippines to boost mobile internet". TeleGeography. 2017-03-16. Retrieved 2017-03-20. ^ "Smart tests VoLTE; claims a first for the Philippines". TeleGeography. 2016-04-18. Retrieved 2016-04-18. ^ "Smart to launch commercial LTE service on 25 August". TeleGeography. 2012-08-20. Retrieved 2013-07-06. ^ "Smart expands LTE coverage to include new 1800 MHz frequency". InterAksyon.com. 2012-09-05. Retrieved 2014-09-28. ^ "PLDT's Smart now offering tri-band LTE". TeleGeography. 2012-09-17. Retrieved 2016-02-02. ^ "PLDT spends PHP2 billion on first-phase deployment of TD-LTE". TeleGeography. 2014-04-25. Retrieved 2014-04-25. ^ "PLDT's Smart switches on LTE-A network". TeleGeography. 2014-08-14. Retrieved 2014-08-14. ^ "Smart starts tri-carrier LTE-A deployment, claiming a first". TeleGeography. 2016-04-14. Retrieved 2016-04-14. ^ "PLDT, Smart fire up first three 700 MHz-powered cell sites". Smart Communications. 2016-06-09. Retrieved 2016-06-12. ^ "Smart ramps up network deployment using new frequencies". Smart. 2016-06-21. Retrieved 2017-08-08. ^ "Smart partners Huawei to deploy 4CC in Boracay". TeleGeography. 2017-08-10. Retrieved 2017-08-21. ^ "Smart Communications activates 5CC carrier aggregation in Marikina City". TeleGeography. 2018-03-26. Retrieved 2018-03-26. ^ "M1 launches VoLTE on LTE-A network". TeleGeography. 2015-04-08. Retrieved 2016-02-18. ^ "M1 readies for LTE launch in city-state". TeleGeography. 2011-06-20. Retrieved 2013-07-06. ^ "M1 goes live with commercial LTE network". TeleGeography. 2012-09-17. Retrieved 2013-07-06. ^ "M1 reports increase in first-quarter revenue, profits". TeleGeography. 2014-04-15. Retrieved 2014-08-19. ^ "M1 launches nationwide LTE-A network". TeleGeography. 2014-12-03. Retrieved 2014-12-03. ^ "SingTel Mobile launches VoLTE service". TeleGeography. 2014-05-20. Retrieved 2016-02-18. ^ "SingTel Mobile launches LTE for business, consumer segments". TeleGeography. 2011-12-20. Retrieved 2013-07-06. ^ "SingTel boosts LTE network with 150Mbps download speeds". TeleGeography. 2013-05-10. Retrieved 2014-08-19. ^ "SingTel Mobile launches LTE-A 300Mbps service". TeleGeography. 2014-06-02. Retrieved 2014-08-19. ^ "Singtel launches LTE-900, improves Wi-Fi coverage". TeleGeography. 2015-07-30. Retrieved 2015-07-30. ^ "Singtel increases peak LTE-A throughput to 450Mbps". TeleGeography. 2017-01-11. Retrieved 2017-01-11. ^ "Singtel to roll out 800Mbps LTE-A in Orchard Road". TeleGeography. 2017-07-24. Retrieved 2017-07-24. ^ "Singtel to offer 1Gbps mobile service this year". TeleGeography. 2018-02-13. Retrieved 2018-02-14. ^ "Singtel 4G+ - Milestones". Singtel. 2018-05-01. Retrieved 2018-09-19. ^ "Ericsson, Singtel record peak speeds of 1.5Gbps in five-carrier aggregation LTE trials". TeleGeography. 2018-09-18. Retrieved 2018-09-19. ^ "StarHub sets 19-Sep as launch date for LTE". TeleGeography. 2012-09-12. Retrieved 2016-02-02. ^ "StarHub's 4G LTE Network Reaches Nationwide Coverage". HardWareZone. 2013-10-18. Retrieved 2013-10-20. ^ "StarHub upgrades 4G speeds to keep pace with rivals". TeleGeography. 2014-09-11. Retrieved 2014-09-12. ^ "StarHub LTE-A coverage reaches 85%; plans 100% by Q3". TeleGeography. 2015-05-28. Retrieved 2016-02-02. ^ "Huawei, StarHub claim 'world's fastest indoor 4G speed'". TeleGeography. 2016-04-15. Retrieved 2016-04-15. ^ "StarHub upgrades 4G capacity with TDD-LTE at The Float@Marina Bay". TeleGeography. 2017-08-07. Retrieved 2017-08-07. ^ "StarHub increases maximum LTE speeds to 1Gbps". TeleGeography. 2018-04-07. Retrieved 2018-04-07. ^ a b c "Korea Communication Review, Aug 2016". Netmanias. 2016-08-01. Retrieved 2016-12-04. ^ a b c "LTE Frequency Commercialization Status in Korea (2011 - 2016)". Netmanias. 2016-12-16. Retrieved 2016-12-17. ^ "KT finally begins introduction of commercial LTE services". TeleGeography. 2012-01-03. Retrieved 2013-07-10. ^ "KT aims to complete nationwide LTE-A rollout by end-2013". TeleGeography. 2013-11-26. Retrieved 2015-06-05. ^ "KT enables higher LTE-A speeds in Seoul". TeleGeography. 2014-01-15. Retrieved 2015-06-05. ^ "LG Uplus inaugurates commercial VoLTE service". TeleGeography. 2012-08-31. Retrieved 2016-02-18. ^ a b "SKT and LG Uplus inaugurate commercial LTE services". TeleGeography. 2011-07-01. Retrieved 2013-07-06. ^ "LG Uplus introduces LTE-A commercial services". TeleGeography. 2013-07-18. Retrieved 2015-06-05. ^ "LG Uplus implements tri-band multicarrier system". TeleGeography. 2014-02-11. Retrieved 2015-06-05. ^ "SKT launches commercial VoLTE service". TeleGeography. 2012-08-08. Retrieved 2016-02-18. ^ "SK Telecom inaugurates commercial LTE-A network". TeleGeography. 2013-06-26. Retrieved 2013-07-06. ^ "SK Telecom enhances LTE network with rollout of services using 1800MHz band". TeleGeography. 2013-09-30. Retrieved 2015-06-05. ^ "SK Telecom starts deploying base stations for LTE in 2100MHz band". TeleGeography. 2014-05-07. Retrieved 2014-05-07. ^ "SK Telecom introducing 225Mbps LTE-A this week". TeleGeography. 2014-06-18. Retrieved 2014-09-26. ^ "SK Telecom introduces tri-band LTE-A commercially". TeleGeography. 2015-01-02. Retrieved 2015-01-02. ^ "SK Telecom launches commercial five-band CA LTE-A Pro service". TeleGeography. 2017-06-05. Retrieved 2017-06-05. ^ "Future LTE Designed by SK Telecom: (1) 4.5G Evolution Roadmap - 5-CA Commercialization and 4x4 MIMO Deployment". Netmanias. 2017-06-13. Retrieved 2017-07-02. ^ "SK텔레콤, 3월 갤럭시 S9 출시하며 1 Gbps LTE 상용화" (in Korean). Netmanias. 2018-02-27. Retrieved 2018-07-01. ^ "Sri Lanka's Dialog launches first VoLTE network on 4G". Lanka Business Online. 2016-09-01. Retrieved 2016-09-01. ^ "Dialog Launches First Mobile 4G-LTE Service". Dialog Axiata. 2013-04-01. Retrieved 2013-04-01. ^ "Dialog rings Sri Lanka's first VoLTE service". DailyFT. 2016-06-23. Retrieved 2016-06-23. ^ "Dialog Launches Sri Lanka's 1st Commercial 4G-LTE Service". Dialog Broadband Networks. 2012-12-30. Retrieved 2012-12-30. ^ "HUTCH to go 4G in 2018". Hutch (Sri Lanka). 2018-10-04. Retrieved 2018-10-04. ^ "Hutch majority shareholder in new merged entity". The Island. 2018-12-13. Retrieved 2018-12-13. ^ "Lanka Bell launches LTE broadband". TeleGeography. 2014-02-12. Retrieved 2014-02-12. ^ "Mobitel's LTE is live in seven cities". TeleGeography. 2013-06-03. Retrieved 2013-06-03. ^ "Mobitel pioneers 4.5G network to revolutionise Sri Lanka's mobile telecom industry". DailyFT. 2018-02-02. Retrieved 2018-02-02. ^ "Sri Lanka Telecom expands 4G to fill broadband gaps". TeleGeography. 2014-01-21. Retrieved 2014-01-21. ^ "Taiwan's APT reaches 1m 4G subs milestone". TeleGeography. 2016-05-18. Retrieved 2016-05-18. ^ "APT soft-launches 4G ahead of official introduction on 24 December". TeleGeography. 2014-12-10. Retrieved 2014-12-10. ^ "Ambit officially enters 4G market with Taiwan's first VoLTE-based offering". TeleGeography. 2015-05-19. Retrieved 2016-02-03. ^ "頻寬加大、上網飛速！ 亞太電信全面啟用900MHz頻段" (in Chinese). Asia Pacific Telecom. 2017-07-04. Archived from the original on 2011-12-06. Retrieved 2017-08-06. ^ "APT inaugurates 2.6GHz TD-LTE network". TeleGeography. 2018-09-19. Retrieved 2018-09-19. ^ "Chunghwa Telecom first to market with commercial 4G services in Taiwan". TeleGeography. 2014-05-30. Retrieved 2014-06-02. ^ "CHT announces the launch of 4G 900MHz Band" (in Chinese). Chunghwa Telecom. 2014-12-29. Retrieved 2014-12-29. ^ a b "Taiwan Star begins offering 4G services using 2.6GHz spectrum". TeleGeography. 2016-04-19. Retrieved 2016-04-19. ^ "中華電信全心建設 4G最大頻寬 技術領先再突破" (in Chinese). Chunghwa Telecom. 2017-06-23. Retrieved 2017-08-06. ^ "Chunghwa to boost speeds with 4C rollout this month". TeleGeography. 2017-07-13. Retrieved 2017-07-15. ^ "CHT officially launches Block C6-1 in 1800MHz". Chunghwa Telecom. 2018-04-11. Retrieved 2018-04-22. ^ "CHT teams up with Samsung Taiwan to reach a new milestone in mobile communication". Chunghwa Telecom. 2018-04-11. Retrieved 2018-04-22. ^ a b c d "台湾の携帯電話事業者各社が3G業務を終了、4G契約のみに" (in Japanese). blogofmobile.com. 2019-01-01. Retrieved 2019-01-05. ^ a b "One, two, three for 4G; Far EasTone and Taiwan Mobile join Chunghwa with LTE launches". TeleGeography. 2014-06-04. Retrieved 2014-06-04. ^ "Far EasTone granted approval to offer 1800MHz LTE services". TeleGeography. 2014-09-01. Retrieved 2014-09-01. ^ "About FarEasTone - Company Information - Milestones 2016". Far EasTone Telecommunications Co., Ltd. 2016-12-31. Retrieved 2018-07-02. ^ "Taiwan's Far EasTone targets 5G services in 2018". GSMA. 2016-09-21. Retrieved 2018-07-02. ^ "Taiwan Mobile launches VoLTE service". 2016-01-27. Retrieved 2016-02-18. ^ "TWM, FET win 1800MHz spectrum for 4G launch in Taiwan". Telecompaper. 2014-09-01. Retrieved 2016-02-18. ^ "Taiwan Mobile targets three million 4G subs by end-2015, having reached 1.1m in 2014". TeleGeography. 2015-02-02. Retrieved 2018-07-02. ^ "台灣大再下一城取得1800MHz新增6.3MHz特許執照" (in Chinese). Taiwan Mobile. 2015-05-08. Retrieved 2016-02-18. ^ "台灣之星率先通過Apple審驗，iPhone 用戶免費開通4G「VOLTE好聲音」" (in Chinese). Taiwan Star Telecom Corporation. 2015-12-09. Retrieved 2016-02-18. ^ "Taiwan Star Cellular officially launches 4G as FET and Taiwan Mobile see continued subscriber gains". TeleGeography. 2014-08-27. Retrieved 2014-08-27. ^ "網路品質再進化！領先同業啟用2600MHz頻段4x4 MIMO技術" (in Chinese). Taiwan Star Telecom Corporation. 2017-06-13. Retrieved 2017-06-13. ^ "AIS launching LTE-1800 this week; agrees terms for ending towers arbitration with TOT". TeleGeography. 2016-01-25. Retrieved 2016-01-25. ^ "AIS claims technology coup with LTE-A; True to follow soon". TeleGeography. 2016-01-28. Retrieved 2016-01-28. ^ "AIS launches VoLTE nationwide, markets '4.5G'; True ramps up LTE marketing". TeleGeography. 2016-03-29. Retrieved 2016-03-29. ^ "Jasmine pays fine; AIS officially receives 900MHz licence". TeleGeography. 2016-07-01. Retrieved 2018-07-13. ^ "AIS enabling '700Mbps' LTE speeds in May". TeleGeography. 2017-04-25. Retrieved 2017-04-25. ^ "AIS introduces Gigabit download speeds via LTE-A, Wi-Fi". TeleGeography. 2017-08-18. Retrieved 2017-08-21. ^ "AIS and TOT sign a roaming agreement". TeleGeography. 2018-01-08. Retrieved 2018-01-08. ^ "DTAC tests VoLTE". 2015-08-04. Retrieved 2016-02-26. ^ "DTAC's 4G goes commercial in Bangkok". TeleGeography. 2014-05-12. Retrieved 2014-05-12. ^ "DTAC's 1800MHz LTE goes live in Bangkok". TeleGeography. 2015-11-03. Retrieved 2015-11-03. ^ "DTAC allocates extra 4G bandwidth; AIS reveals LTE battle plans". TeleGeography. 2015-12-07. Retrieved 2015-12-07. ^ "dtac เปิดใช้ 4G 1800 เต็มพิกัด 20MHz กว้างที่สุดบนคลื่นเดียว" (in Thai). brandinside.asia. 2016-07-12. Retrieved 2018-07-03. ^ "DTAC soft-launches TD-LTE services in 2300MHz band". TeleGeography. 2018-05-21. Retrieved 2018-05-21. ^ "DTAC taps Nokia for 2300MHz TD-LTE rollout". TeleGeography. 2018-07-12. Retrieved 2018-07-12. ^ "True 4G launch trumps rivals; AIS claims 800,000 users at official 2100MHz launch; DTAC waits until June". TeleGeography. 2013-05-09. Retrieved 2013-07-06. ^ "True launching 1800MHz LTE next week to trump AIS". TeleGeography. 2015-12-03. Retrieved 2015-12-03. ^ "True reaches terms with CAT to continue 2G services for another year". TeleGeography. 2015-12-09. Retrieved 2015-12-09. ^ "True Corp deploys world's largest 4T4R 4.5G network". telecomasia.net. 2016-07-04. Retrieved 2016-07-08. ^ "VNPT-Vinaphone tests LTE-A in Phu Quoc, HCM City". TeleGeography. 2016-01-19. Retrieved 2016-01-20. ^ "VNPT-Vinaphone launches LTE on Phu Quoc Island". TeleGeography. 2016-11-04. Retrieved 2016-11-04. ^ "Viettel launches 4G pilot in Ba Ria-Vung Tau". TeleGeography. 2015-12-11. Retrieved 2015-12-11. ^ "Viettel to trial 4G from start of next year". TeleGeography. 2016-08-18. Retrieved 2016-08-18. ^ "Viettel launches 4G with 'nationwide' coverage". TeleGeography. 2017-04-19. Retrieved 2017-04-19. ^ "Aquafon launches LTE in main cities". TeleGeography. 2014-08-08. Retrieved 2014-08-08. ^ "Baktelecom launches TD-LTE broadband around Baku". TeleGeography. 2018-04-04. Retrieved 2018-04-04. ^ "Baktelecom". Halberd Bastion. Retrieved 2018-08-31. ^ a b c "Nakhtel plans 4G rollout in Nakhchivan, Azerbaijan". TeleGeography. 2014-09-01. Retrieved 2018-11-23. ^ a b c "Naxtel 4G is already with you!". Nakhtel. 2016-11-03. Retrieved 2018-11-23. ^ a b c "About". Nakhtel. Retrieved 2018-11-23. ^ a b "Sazz". Halberd Bastion. Retrieved 2018-08-31. ^ "AzQtel demonstrates 900Mbps TD-LTE-A speeds, 1Gbps speeds mooted for 2017". TeleGeography. 2015-12-07. Retrieved 2015-12-07. ^ "Talkin' all that SAZZ: AzQtel trumpets TD-LTE numbers". TeleGeography. 2014-12-01. Retrieved 2014-12-02. ^ "AzTelekom launches 4G LTE fixed broadband pilot project". TeleGeography. 2018-05-16. Retrieved 2018-05-16. ^ "SAZZ launches TD-LTE network in Baku, Absheron". TeleGeography. 2018-06-28. Retrieved 2018-06-28. ^ "B-Mobile poised to launch LTE in Thimpu". TeleGeography. 2013-10-22. Retrieved 2013-12-27. ^ "TashiCell launches 4G in three dzongkhags". Kuensel Corporation Ltd. 2016-04-04. Retrieved 2016-04-09. ^ "Tashicell launches LTE in Bhutan". TeleGeography. 2016-03-31. Retrieved 2016-04-01. ^ "DST Communications launches LTE in Brunei". TeleGeography. 2014-01-14. Retrieved 2014-01-19. ^ a b c "Airtel launches VoLTE services in Mumbai". TeleGeography. 2017-09-12. Retrieved 2017-09-12. ^ "Airtel to move 900MHz to LTE, mulls 3G shutdown". TeleGeography. 2018-10-29. Retrieved 2018-10-29. ^ "Airtel rolls out 900MHz LTE in ten circles". TeleGeography. 2019-01-24. Retrieved 2019-01-24. ^ a b c d e f g h i j "Pan India 2015 spectrum holding data sheet (updated)". telecomtalk.info. 2017-05-05. Retrieved 2018-01-29. ^ "Airtel enlists Nokia for 1800MHz FDD-LTE rollout, TD-LTE expansion". TeleGeography. 2015-01-28. Retrieved 2015-01-28. ^ "Airtel launches Rajasthan's first 4G service in Ajmer". Airtel. 2016-01-12. Retrieved 2016-01-20. ^ "Telenor to complete 4G rollout by end-March 2017, considers exit from India". TeleGeography. 2016-04-11. Retrieved 2016-04-11. ^ a b "Airtel, Vodafone and Telenor expand, upgrade 4G networks". TeleGeography. 2016-09-01. Retrieved 2016-09-01. ^ "Telenor to expand narrowband-LTE network to ten more towns". TeleGeography. 2016-12-19. Retrieved 2016-12-19. ^ "Airtel augments LTE network in Goa, Maharashtra with 1800MHz spectrum". TeleGeography. 2017-02-17. Retrieved 2017-02-18. ^ "DoT approves Telenor acquisition by Airtel". TeleGeography. 2018-05-15. Retrieved 2018-05-15. ^ "Airtel completes acquisition of Videocon spectrum". TeleGeography. 2016-05-25. Retrieved 2016-05-28. ^ "Bharti launches India's first LTE network". TeleGeography. 2012-04-10. Retrieved 2013-07-06. ^ "Aircel launches India's second 4G network". TeleGeography. 2014-07-17. Retrieved 2014-07-17. ^ "Tikona Digital Launches 4G Home Broadband Services 'ZabbarDus' In Varanasi". TeleAnalysis. 2015-10-02. Retrieved 2016-09-12. ^ "Airtel 4G available in 22 circles following Assam launch". TeleGeography. 2016-12-21. Retrieved 2016-12-21. ^ "Airtel completes TDN takeover, TRAI opens consultation for spectrum auction". TeleGeography. 2017-08-30. Retrieved 2017-08-30. ^ "Airtel completes Augere takeover". TeleGeography. 2016-01-06. Retrieved 2016-01-29. ^ "Airtel agrees acquisition of Aircel 4G spectrum". TeleGeography. 2016-04-13. Retrieved 2016-04-13. ^ "Airtel completes acquisition of Aircel airwaves in Andhra Pradesh". TeleGeography. 2016-11-23. Retrieved 2016-11-23. ^ "Airtel agrees to buy Tikona 4G business". TeleGeography. 2017-03-24. Retrieved 2017-03-24. ^ "DoT clears 4G transfer of TDN spectrum in Rajasthan". TeleGeography. 2017-12-04. Retrieved 2017-12-10. ^ "Airtel launches LTE in Ladakh". TeleGeography. 2017-12-12. Retrieved 2017-12-12. ^ "DoT accepts BSNL 4G spectrum proposal". TeleGeography. 2018-09-11. Retrieved 2018-09-11. ^ "BSNL launches commercial 4G in areas of rural Chennai". TeleGeography. 2019-04-01. Retrieved 2019-04-01. ^ a b c "Jio launches full commercial service". TeleGeography. 2016-09-05. Retrieved 2016-09-05. ^ "RCOM/SSTL merger gets final approval from DoT". TeleGeography. 2017-10-24. Retrieved 2017-10-24. ^ "RCOM/Aircel merger passes CCI hurdle, Airtel in talks for TDN's 2300MHz spectrum". TeleGeography. 2017-03-20. Retrieved 2017-03-20. ^ "Jio 4G on 850MHz LTE goes live in Kerala, Tamilnadu and Karnataka". telecomtalk.info. 2016-07-11. Retrieved 2016-07-11. ^ a b c "Jio's 850 MHz LTE network is live in nine circles offering better indoor coverage". telecomtalk.info. 2016-06-10. Retrieved 2016-09-01. ^ "RCOM set to migrate CDMA customer base to 4G network". TeleGeography. 2016-04-08. Retrieved 2016-04-11. ^ "RCOM and RJIL sign 800MHz spectrum sale/sharing and ICR deal". TeleGeography. 2016-01-18. Retrieved 2016-01-19. ^ "Reliance 4G LTE goes live in Mumbai circle, speeds same as Jio 4G". Telecomtalk.info. 2016-07-10. Retrieved 2016-07-10. ^ "RJIL to make LTE available to employees on 27 December". TeleGeography. 2015-12-21. Retrieved 2015-12-21. ^ a b c "Idea completes VoLTE rollout". TeleGeography. 2018-06-20. Retrieved 2018-06-20. ^ "Idea launches LTE in three new circles, maps out expansion plans". TeleGeography. 2016-01-15. Retrieved 2016-01-19. ^ "Idea to roll out 4G in nine new circles by March 2017". TeleGeography. 2016-11-24. Retrieved 2016-11-24. ^ a b "Idea expanding LTE to 20 circles; planning VoLTE launch". TeleGeography. 2017-01-31. Retrieved 2017-01-31. ^ a b "Idea to bolster 4G capacity in Maharashtra with new spectrum". TeleGeography. 2017-11-24. Retrieved 2017-12-10. ^ a b c "Vodafone/Idea merger gets conditional approval from SEBI". TeleGeography. 2017-08-09. Retrieved 2017-08-10. ^ a b "Vodafone and Idea complete merger, creating India's largest mobile provider". TeleGeography. 2018-08-31. Retrieved 2018-08-31. ^ "Vodafone India launches VoLTE". TeleGeography. 2018-02-09. Retrieved 2018-02-09. ^ "Vodafone India expanding 4G from nine to 17 circles by March". TeleGeography. 2016-11-11. Retrieved 2016-11-12. ^ "Vodafone launches 4G, holds talks with RCOM over sharing 3G spectrum". TeleGeography. 2015-12-17. Retrieved 2015-12-17. ^ a b c d e "Kazakh cellcos to share 4G networks". TeleGeography. 2016-08-31. Retrieved 2016-08-31. ^ a b c "Beeline launches 4G in Kazakhstan". TeleGeography. 2016-07-07. Retrieved 2016-07-07. ^ a b "Beeline Kazakhstan extends 4G trial to fourth city". TeleGeography. 2016-06-10. Retrieved 2016-06-10. ^ a b "Beeline and K'cell announce 4G pilots in Kazakhstan". TeleGeography. 2016-03-09. Retrieved 2016-03-09. ^ a b "Kcell launches LTE in four cities". TeleGeography. 2016-09-01. Retrieved 2016-09-01. ^ a b "Altel launches Kazakhstan's first LTE-A networks". TeleGeography. 2017-04-06. Retrieved 2017-04-06. ^ "Tele2 Kazakhstan launches 4G services". TeleGeography. 2016-03-02. Retrieved 2016-03-02. ^ "Tele2 and Altel to combine Kazakh operations". TeleGeography. 2015-11-04. Retrieved 2016-03-02. ^ "Kazakhtelecom launches LTE in Astana, Almaty through Altel unit". TeleGeography. 2013-01-02. Retrieved 2013-07-06. ^ "LTC's telephony base rises 11%, reports Thaicom". TeleGeography. 2014-02-18. Retrieved 2016-01-30. ^ "LTC set to launch Laos's first 4G network next month". TeleGeography. 2012-10-30. Retrieved 2016-01-30. ^ "Unitel launches 4G in Vientiane and other major cities". TeleGeography. 2015-06-24. Retrieved 2015-06-24. ^ "3 Macau launches SAR's fourth LTE network; VoLTE by mid-2016". TeleGeography. 2015-12-16. Retrieved 2015-12-16. ^ "China Telecom Macau launches LTE; 3 Macau to follow in mid-December". TeleGeography. 2015-11-26. Retrieved 2015-11-26. ^ a b "CTM gives Macau first commercial LTE service". TeleGeography. 2015-10-22. Retrieved 2015-10-22. ^ a b "CTM launching 4G user trial next month". TeleGeography. 2015-08-25. Retrieved 2016-02-01. ^ a b "Finally 4G LTE launched in Macau - 4 operators start 4G LTE by the end of 2015" (in Japanese). 2015-11-30. Retrieved 2015-12-08. ^ "SmarTone Macau hands Nokia five-year LTE contract". TeleGeography. 2015-11-12. Retrieved 2015-11-13. ^ a b "Dhiraagu launches LTE-A services in Maldives". TeleGeography. 2015-09-14. Retrieved 2015-09-14. ^ "Dhiraagu 4G coverage reaches 50% of Maldivians". TeleGeography. 2015-01-23. Retrieved 2015-01-26. ^ "Dhiraagu goes live with 4G in Male". TeleGeography. 2014-10-29. Retrieved 2014-10-29. ^ "Ooredoo Maldives launches VoLTE". TeleGeography. 2018-04-02. Retrieved 2018-04-02. ^ "Wataniya offers 4G for mobile handsets users". TeleGeography. 2013-12-02. Retrieved 2013-12-03. ^ "Wataniya Maldives adopts Ooredoo branding". TeleGeography. 2013-12-24. Retrieved 2013-12-24. ^ "Ooredoo 4G now available across all tariff plans". TeleGeography. 2015-06-03. Retrieved 2016-02-02. ^ "Ooredoo trials LTE-A in the Maldives". TeleGeography. 2014-10-24. Retrieved 2016-02-02. ^ "Ooredoo launches '4G+' on 40 Maldivian islands". TeleGeography. 2017-01-03. Retrieved 2017-01-03. ^ a b "Mongolia's MobiCom launches LTE-A". TeleGeography. 2017-11-27. Retrieved 2017-12-03. ^ "MobiCom has launched its 4G-LTE". Mobicom. 2016-05-17. Retrieved 2016-09-18. ^ "Frequently Asked Questions - #11 & #23". Mobicom. 2016-05-17. Retrieved 2016-09-18. ^ "The Unitel customers will first use the 4G LTE". Unitel. 2016-04-01. Retrieved 2016-04-01. ^ "Ncell launches 4G LTE service in the Kathmandu Valley". TeleGeography. 2017-06-02. Retrieved 2017-06-02. ^ "NTA grants Ncell LTE network permission despite PAC protests". TeleGeography. 2017-05-08. Retrieved 2017-05-08. ^ "Ncell prepares for 4G launch in three cities". TeleGeography. 2016-11-15. Retrieved 2016-11-15. ^ "Ncell seeks 4G approval". TeleGeography. 2016-11-01. Retrieved 2016-11-01. ^ "Nepal edges closer to 4G launch". TeleGeography. 2016-09-27. Retrieved 2016-09-30. ^ "Nepal Telecom launches post-paid 4G". TeleGeography. 2017-01-03. Retrieved 2017-01-03. ^ "NTA grants Smart Telecom 4G licence". TeleGeography. 2017-05-25. Retrieved 2017-05-25. ^ "Nepal's Smart Telecom launches 4G service". TeleGeography. 2017-10-30. Retrieved 2017-10-31. ^ a b "Telenor Pakistan enables VoLTE". TeleGeography. 2019-02-04. Retrieved 2019-02-04. ^ "Telenor Pakistan launches 4G with free offer; Zong's LTE reaches 100 cities". TeleGeography. 2016-08-11. Retrieved 2016-08-11. ^ a b "Telenor Pakistan launches LTE-A network". TeleGeography. 2018-12-07. Retrieved 2018-12-07. ^ "PTCL inks MoU with edotco; Jazz launches LTE on 900MHz band". TeleGeography. 2019-03-15. Retrieved 2019-03-15. ^ "Jazz receives 4G licence". TeleGeography. 2017-07-04. Retrieved 2017-07-04. ^ "Mobilink/Warid to begin merger process". TeleGeography. 2017-01-09. Retrieved 2017-01-09. ^ "Warid launches commercial LTE services". TeleGeography. 2015-01-02. Retrieved 2015-01-02. ^ "Zong launches Pakistan's first 4G network". TeleGeography. 2014-09-29. Retrieved 2014-09-29. ^ "Pakistan spectrum auction nets USD1.1bn, Zong secures only 4G licence". TeleGeography. 2014-04-24. Retrieved 2014-04-24. ^ "PTCL rolls out LTE upgrade, switches off CDMA system in major cities". TeleGeography. 2018-09-13. Retrieved 2018-09-19. ^ Aamir Attaa (2019-02-09). "Ufone is Going 4G/LTE in Pakistan". ProPakistani. Retrieved 2019-02-19. ^ "Wi-Tribe to launch LTE-A by May". TeleGeography. 2017-02-08. Retrieved 2017-02-08. ^ "Wi-Tribe to launch 4.5G service in Pakistan from June". dawn.com. 2017-03-21. Retrieved 2017-06-05. ^ "Wi-tribe installs first ever 4.5G LTE network in Pakistan". techjuice.pk. 2017-03-20. Retrieved 2017-06-05. ^ "wi-tribe begins deployment of first ever LTE-Advanced network in Pakistan". wi-tribe. 2017-04-20. Retrieved 2017-06-05. ^ "wi-tribe". wi-tribe. Retrieved 2019-02-19. ^ a b c "Vimpelcom (Beeline) launches commercial VoLTE service in Moscow". TeleGeography. 2015-04-23. Retrieved 2016-02-18. ^ a b "Russia round-up: MegaFon extends LTE-A to St Petersburg; Vimpelcom follows suit in Moscow; Roskomnadzor confirms 4G rollout progress". TeleGeography. 2014-09-04. Retrieved 2016-02-11. ^ a b "Vimpelcom launches LTE network in Moscow". TeleGeography. 2013-05-28. Retrieved 2013-10-08. ^ a b "MTS tests 10Gbps radio transmission; Beeline, MegaFon share 1,300 LTE-1800 BTS in ten regions". TeleGeography. 2017-03-06. Retrieved 2017-03-06. ^ a b "Beeline, Tele2 Russia to share networks in 27 regions". TeleGeography. 2016-08-30. Retrieved 2016-08-30. ^ "Beeline adds MegaFon LTE network sharing deal to its arrangements with MTS". TeleGeography. 2016-01-28. Retrieved 2016-02-11. ^ a b c "Vimpelcom, MTS ink deal to collaborate on LTE". TeleGeography. 2014-12-22. Retrieved 2016-02-11. ^ a b "MTS, Beeline share 4G spectrum". TeleGeography. 2016-11-30. Retrieved 2016-11-30. ^ a b c d "MegaFon claims VoLTE first in Moscow". TeleGeography. 2016-09-29. Retrieved 2016-09-30. ^ "Megafon to start LTE on 800 MHz band in St Petersburg". Telecompaper. 2014-08-25. Retrieved 2016-02-12. ^ a b "MegaFon claims 979Mbps 4.5G speeds in Moscow". TeleGeography. 2017-08-10. Retrieved 2017-08-10. ^ a b "MegaFon achieves 1Gbps in tests, claims '5G' level performance". TeleGeography. 2016-06-20. Retrieved 2016-06-20. ^ "Megafon launches LTE network in Izhevsk". Telecompaper. 2015-02-05. Retrieved 2016-02-12. ^ "MegaFon's 300Mbps LTE-A hailed as world's first". TeleGeography. 2014-02-26. Retrieved 2016-02-12. ^ "MegaFon trumpets LTE achievements; confirms full integration of Yota". TeleGeography. 2014-04-28. Retrieved 2014-04-28. ^ "MegaFon completes Yota buyout". TeleGeography. 2013-10-03. Retrieved 2013-10-08. ^ "MegaFon launches 4G services via Yota; resolves ownership disputes". TeleGeography. 2012-04-24. Retrieved 2013-10-08. ^ "Yota tests LTE in Novosibirsk". TeleGeography. 2011-12-21. Retrieved 2013-10-08. ^ "Megafon cleared to deploy LTE-TDD in Moscow". Telecompaper. 2012-08-22. Retrieved 2016-02-12. ^ "MegaFon plots TD-LTE network to complement Yota MVNO". TeleGeography. 2012-05-03. Retrieved 2016-02-12. ^ "MOTIV bolsters LTE network with VoLTE and FDD-TDD technologies". TeleGeography. 2018-05-21. Retrieved 2018-05-21. ^ "Motiv launches new LTE tariffs". Telecompaper. 2014-11-06. Retrieved 2016-02-12. ^ a b c d e "MTS launches VoLTE, Wi-Fi calling in Moscow". TeleGeography. 2018-04-05. Retrieved 2018-04-05. ^ a b c d "MTS to launch 187Mbps LTE speeds in Moscow by September". TeleGeography. 2016-06-06. Retrieved 2016-06-11. ^ "MTS launches 800MHz LTE in Moscow; talks up 2014 achievements". TeleGeography. 2015-01-29. Retrieved 2015-01-29. ^ a b c "MTS deploys multi-standard Ericsson Radio System supporting FDD/TDD LTE-A Pro". TeleGeography. 2017-02-03. Retrieved 2017-02-05. ^ a b c "MTS launches 4.5G in Moscow, Saint Petersburg, Ufa and Yakutsk". TeleGeography. 2016-12-16. Retrieved 2016-12-16. ^ a b "MTS launching LTE-A in 15 regions by end-2015". TeleGeography. 2015-06-24. Retrieved 2016-12-16. ^ "MegaFon upgrades network in Ryazan region; MTS deploys LTE-1800 in Bashkortostan". TeleGeography. 2015-01-12. Retrieved 2016-02-12. ^ "MTS launches Gigabit LTE-LAA service in Ufa". TeleGeography. 2018-05-18. Retrieved 2018-05-18. ^ "Down on the (re)farm: MTS deploys 2100MHz LTE to remote settlements". TeleGeography. 2019-02-08. Retrieved 2019-02-08. ^ "MTS boosts Moscow coverage with FD-LTE rollout". TeleGeography. 2013-06-03. Retrieved 2013-10-08. ^ "Russian LTE round-up: Rostelecom postpones MVNO launch, MTS goes live in Moscow, Kazan boasts 4G triple-threat". TeleGeography. 2012-09-05. Retrieved 2013-10-08. ^ "Tattelecom unit launches LTE-1800 network in Kazan". TeleGeography. 2014-07-01. Retrieved 2014-07-01. ^ a b c d "Rostelecom board approves Tele2 mobile merger". TeleGeography. 2013-12-13. Retrieved 2014-12-19. ^ "Tele2 Russia begins LTE-450 rollout". TeleGeography. 2016-05-16. Retrieved 2016-06-23. ^ "Tele2 launches Russia's first LTE-450 network under Skylink brand". Tele2 Russia. 2016-05-27. Retrieved 2016-05-31. ^ a b "Rostelecom launches LTE in Sochi". TeleGeography. 2013-06-04. Retrieved 2013-10-08. ^ "Tele2 Russia launches 4G in Tula, 3G in the Tambov region and provides St Petersburg update". TeleGeography. 2014-12-19. Retrieved 2014-12-19. ^ "Vainakh Telecom authorised to launch LTE?". TeleGeography. 2013-08-20. Retrieved 2016-02-11. ^ "Roskomnadzor objects to Vainakh Telecom LTE launch in Chechnya". TeleGeography. 2013-01-23. Retrieved 2013-09-12. ^ "MegaFon launches 4G in South Ossetia". TeleGeography. 2013-03-18. Retrieved 2018-05-29. ^ a b "Dialog Axiata launching VoLTE in Sri Lanka". TeleGeography. 2017-04-03. Retrieved 2017-04-04. ^ a b "Dialog launches Sri Lanka's first VoLTE". TeleGeography. 2016-09-09. Retrieved 2016-09-09. ^ "Dialog Axiata launches mobile FDD-LTE following licence win". TeleGeography. 2013-04-02. Retrieved 2013-07-06. ^ "Dialog Axiata launches TD-LTE home broadband in Colombo". TeleGeography. 2017-05-25. Retrieved 2017-05-25. ^ a b "Sri Lankan duo introduce commercial LTE products". TeleGeography. 2013-01-02. Retrieved 2016-02-03. ^ "CK Hutchison, Etisalat finalise mobile merger in Sri Lanka". TeleGeography. 2018-12-05. Retrieved 2018-12-13. ^ "Lanka Bell launches LTE broadband". TeleGeography. 2014-02-12. Retrieved 2016-02-03. ^ "Mobitel enhances Sri Lankan LTE coverage through sub-1GHz band deployment". TeleGeography. 2017-10-03. Retrieved 2017-10-03. ^ a b c "Mobitel pushes to launch evolved 4G network". TeleGeography. 2018-02-07. Retrieved 2018-02-07. ^ "Sri Lanka Telecom expands 4G to fill broadband gaps". TeleGeography. 2014-01-21. Retrieved 2016-02-03. ^ "SLT, Huawei carry out successful LTE-A Pro trial". TeleGeography. 2017-06-06. Retrieved 2017-10-03. ^ "SLT completes LTE-A Pro trial". TeleGeography. 2017-11-21. Retrieved 2017-11-26. ^ a b "Babilon-M expands 4G network outside of the capital". TeleGeography. 2016-02-17. Retrieved 2016-02-18. ^ a b "Babilon-Mobile inaugurates commercial LTE services". TeleGeography. 2012-10-09. Retrieved 2013-08-15. ^ "MegaFon Tajikistan expands 4G pilot service to smartphones". TeleGeography. 2015-10-22. Retrieved 2015-10-22. ^ "Tcell inaugurates 4G network". TeleGeography. 2014-04-23. Retrieved 2014-04-23. ^ "Telkomcel launches 4G in Timor-Leste". TeleGeography. 2017-09-28. Retrieved 2017-09-28. ^ "Viettel's Telemor unit launches 4G in Timor-Leste". TeleGeography. 2017-08-02. Retrieved 2017-08-02. ^ "Timor Telecom deploys SES service upgrade for new LTE network". TeleGeography. 2017-09-07. Retrieved 2017-09-07. ^ "TMCELL starts to connect the subscribers to the LTE network". TMCELL. 2013-09-17. Retrieved 2013-09-18. ^ "'Historic' launch of LTE in Uzbekistan". TeleGeography. 2014-09-05. Retrieved 2014-09-05. ^ "EVO expands TD-LTE network". TeleGeography. 2015-10-23. Retrieved 2015-10-23. ^ "Survival of the fastest: EVO sets date for TD-LTE launch". TeleGeography. 2015-03-23. Retrieved 2015-03-23. ^ "Ucell launches LTE in Samarkand". TeleGeography. 2015-10-22. Retrieved 2015-10-22. ^ "Ucell launched 4G". UzReport. 2014-11-29. Retrieved 2016-02-03. ^ "UCell acquires 4G mobile licence". TeleGeography. 2010-07-26. Retrieved 2016-02-02. ^ "Now 4G is in Bukhara and Navoi!". Ucell. 2016-08-31. Retrieved 2017-07-01. ^ "4G from Ucell". Ucell. 2017-05-15. Retrieved 2017-07-01. ^ "Uzmobile aiming for nationwide LTE coverage by end-2018". TeleGeography. 2017-07-25. Retrieved 2017-12-04. ^ "Зона покрытия GSM" [GSM coverage area] (in Russian). Uzmobile. Retrieved 2017-12-04. ^ "UMS launches LTE in Samarkand". TeleGeography. 2017-09-04. Retrieved 2017-09-04. ^ "UMS launches LTE in Tashkent". TeleGeography. 2016-06-21. Retrieved 2016-06-22. This page was last edited on 17 April 2019, at 15:18 (UTC).